When it comes to safety and improving your home, the front entrance is one of the most important places as it sees frequent traffic. There are many different types of renovations you can choose to improve the entrance. 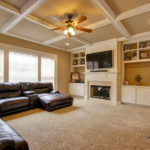 Whether you want to protect kids, elderly relatives, or just yourself as you begin to age in place, consider these remodel ideas. A new entry door is a perfect way to start out an effective entrance remodel. We suggest widening the doorway to at least 36 inches if your current door is smaller than that. This is an excellent change that makes it easy to navigate through the doorway and makes it easier to move furniture or equipment into the home. You may also want to consider larger doors for other frequently used entrances to the home. Make sure to include a low or no-step threshold to avoid potential slips and falls. Nobody likes waiting in the rain, especially if they have to fish out keys or balance groceries while opening the door! So, if your entrance area doesn’t have much protection from the elements, consider adding some. This does not have to be an expensive project! A simple portico, canopy or overhang can make a lot of difference. Speaking of groceries, people often enter and exit homes while they are carrying things. This is why it’s so nice to have a nearby storage shelf in your entryway on the outside of your home. This gives you a place to put groceries, tools, and other items, and it’s particularly handy for people who may need to make several trips to bring everything inside. When it gets dark, you may find that your eyesight isn’t what it used to be (age can be an important factor here), and navigating your porch may become a little dangerous. A little extra lighting can help! Today’s LED lights are often brighter and longer-lasting than traditional porch lights. If you have steps around your entrance, mark them with built-in step lights at the ground level. 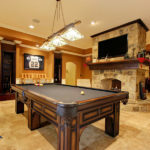 If you are worried about intruders, a well-placed spotlight or two here can make a lot of difference. This remodel is pretty simple. If your porch and entrance steps don’t already have handrails, then upgrade to some railing! It’s a great safety feature and looks nice, too. 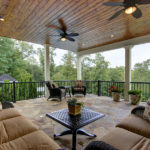 Try to match the materials your porch already uses. Does your entryway, sidewalk, or steps get a little slick when it’s raining outside? Protect against a potential fall by installing textured pavers and concrete that won’t get as slippery when they are wet. These textured materials will help provide additional traction and avoid possible slick surfaces. 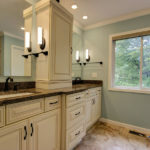 Have more questions about remodels for a particular home or building? At Quality Craftsmen, we’ve been helping members of the East Cobb community transform their home so they can comfortably age in place. Contact us today to ask questions and get a free quote!